January 6, 2012. 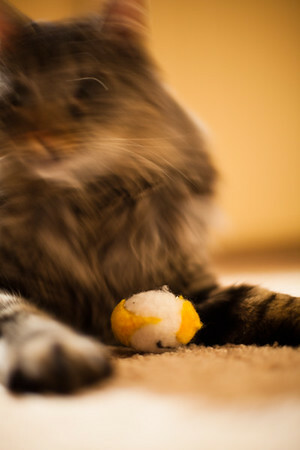 Saki Cat - Always the whirling dervish. She loves to fetch and will retrieve over and over and over, returning whatever it is, dropping it nearby and trilling, until you throw it again. Shown here is a crinkly happy-face fuzzball, which is one of her favorites. And, she'll alternate who she brings it back to for the next throw. She'll dig it out from behind things, if it lands there, or out from the midst of other things - such as the basket of shoes we have by the back door. Over and Over and Over. Always a ball of energy. The photo was taken with a Canon 5DmkII, a 50mm f/1.4 lens, and available light. Exposure: 1/4 second at f/1.4, ISO 200. The camera was handheld, which likely accounts for some of the lack of focus. The constant motion of the cat accounts for most of the rest. Using the wide aperture gives me a very short depth of field - this is one of my favorite go-to methods for cat photos and the like, focusing attention on piece of the greater whole. I was shooting from a low point of view - with the camera was basically sitting on the ground. This is another of my preferences for cat or pet photos. Shoot from their eye level, their point of view. What could I have done better? I feel the photo is a bit flat, color-wise, and soft, focus-wise. I probably could have use a tripod or similar, though that can be tough if you're following a moving target like a cat. I could alternately have cranked the ISO a bit to give me a higher shutter-speed which would have been easier to handhold without completely sacrificing the motion blur. The 5D2 is good enough in low light that wouldn't have introduced my noise; that was one of the reasons I bought it in the first place. Finally, looking at the picture, I think its likely time for a new cat toy - that one is looking a bit too well enjoyed.